We’d love your help. Let us know what’s wrong with this preview of A Luxury We Cannot Afford by Christine Chia. As our island nation approaches its 50th anniversary wielding extraordinary wealth and prosperity, it is timely to review the narrative that has shepherded us through the pas Singapore is a country of many invented, transplanted, or self-made myths and fables, but one looms above them all. 1969 marks the famous declaration of the myth: "Poetry is a luxury we cannot afford." To ask other readers questions about A Luxury We Cannot Afford, please sign up. One book with varying views that offer different perspectives that truly got to me - both the use of the language of the poets contributing to this anthology, and also what each of these poems meant. Kudos to The Man who inspired these wonderful works. 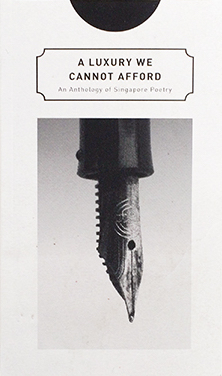 A collection of poems in honour of Singapore's founding father who once famously said that poetry was 'a luxury we cannot afford' in building our new nation. How times have changed with poetry books being published each and every year now, mostly by local publisher Math Paper Press, which has put this beautiful volume together. All on Lee Kuan Yew. Poets recount historical events; go into his mind; tell of his love of his wife, his country; his pain? ; his regrets?. We can only speculate. So many be A collection of poems in honour of Singapore's founding father who once famously said that poetry was 'a luxury we cannot afford' in building our new nation. So many beautiful pieces that I cannot list my favourites. In this anthology of poems, 56 of our country's best poets dedicate poems to "The Man". He had raised a country from the ashes to beauty - but there were things that even great men like him can't never get away with saying. One was his (in)famous maxim: "Poetry is a luxury we cannot afford". Perspectives are essential in life, and I had the opportunity to read this after The Man has passed on. This gave me a wonderful chance to read the anthology in retrospect, rather than the original intention, being published in 2014. There is a whole plethora of ideas, some placed in uncanny juxtapositions, others in intriguing methods, yet perhaps these unplanned contradictions hint at a complicated portrait of The Man. I thoroughly enjoyed this anthology, of which I can quote the ending lines Perspectives are essential in life, and I had the opportunity to read this after The Man has passed on. This gave me a wonderful chance to read the anthology in retrospect, rather than the original intention, being published in 2014. There is a whole plethora of ideas, some placed in uncanny juxtapositions, others in intriguing methods, yet perhaps these unplanned contradictions hint at a complicated portrait of The Man. I thoroughly enjoyed this anthology, of which I can quote the ending lines of the final poem, which offers us another avenue to consider our founding father in. I now appreciate local literature. It's something to be able to understand the writers' and their lingo. It's something to understand things because you're Singaporean, it makes it a lot more relatable and a lot more raw. I feel connected somehow. There are really good poems in this collection, such as "Cut". It's one of my personal favourites. I feel a lot more optimistic about the local literature scene after reading this collection. Maybe we're onto something here.